Remodeling your kitchen or bathroom can be expensive and labor-intensive. 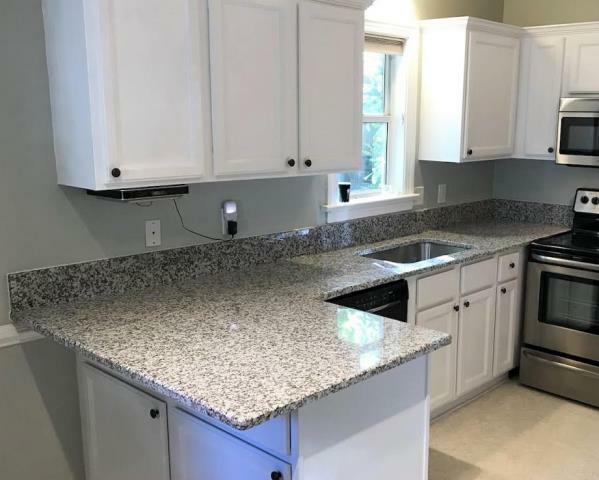 That’s why Panda Kitchen & Bath of Richmond VA provides our customers with high quality wood cabinets and granite countertops at competitive prices in the Short Pump area. 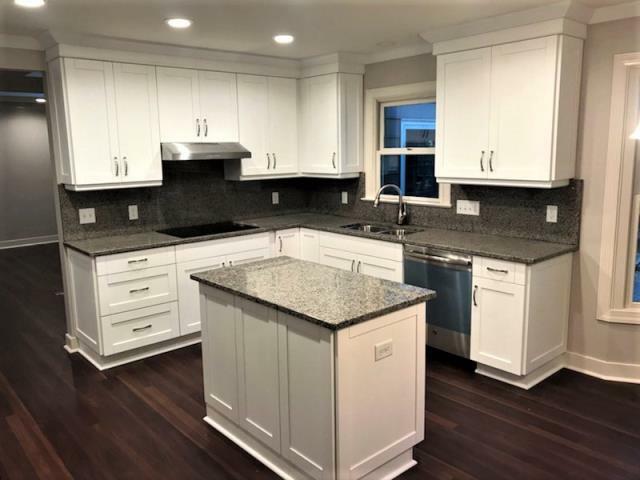 Our team of designers, installers, and project coordinators have over a decade of experience in kitchen and bath remodeling, and are ready to tackle any project large or small. 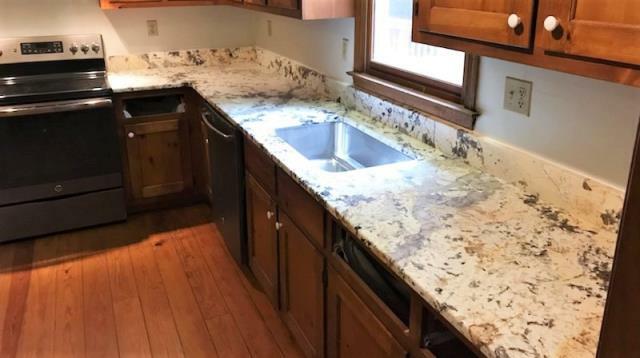 We offer a large selection of cabinets, countertops, and sinks in stock in our showroom, and provide free measurements, designs, and estimates for every project. If it’s time to update your Glen Allen area home, call Panda Kitchen & Bath today for a free consultation. Absolutely fabulous experience with new counter tops start to finish! From the second I walked into the showroom and met Molly I knew I did not need to look anywhere else! Customer service was perfect. Expertise beyond anything i could have imagined. The whole experience was fun, positive and efficient! I would never go anywhere else for kitchen and bath projects. Excellent customer service from product selection to installation. They all went over and above to help us renovate our kitchen while we live out of town. Very good experience!! Would highly recommend. May and her team did an awesome job updating our countertops. After an issue was discovered during installation, May took care of the issue immediately and everything was still completed on time. I understand that second trip had to made from Norfolk to bring the additional granite needed, but the team stayed late to get it done! I would not hesitate to recommend them. May and Jay = The Dream Team! I went in on a Saturday and picked out the lovely Caledonia granite. The following week's schedule was already full for me, so in order to get the kitchen measured right away and get me an estimate, May sent Jay out later that same day! 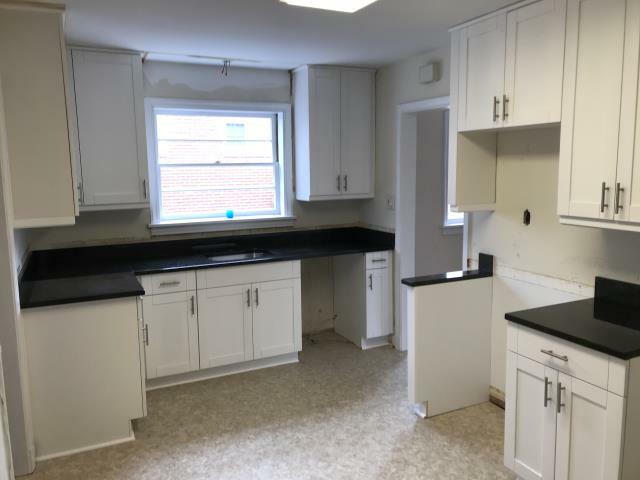 Installation was done in a timely manner and everyone went above and beyond to answer my questions and work around issues common to older homes and previous less-than-perfect workmanship. The counters and backsplash look great. I highly recommend Kitchen and Bath Expo! Panda was wonderful and helpful the whole way through. They were very efficient and installed my entire kitchen in just one day. The quality is amazing and the price was unbeatable. I was very happy with the whole process, from the design all the way to install. They helped reorganized my kitchen so it made sense, had a great eye for design, and made the whole process extremely easy. Would highly recommend! We are very satisfied with the service from Panda Kitchen and Bath. May was very knowledgeable and gave us some great ideas for doing our cabinets layouts. We are also satisfied with the price. The cabinets are of high quality and precision. The installer were very good at what they did and very courteous. My husband knows construction and he could tell they knew what they did. Thank you again May we are very happy. I have used Panda kitchens on three different houses, with great results. I respect their opinions, and suggestions, I have also recommended them to friends, and the feedback has always been positive. When I went to May I had no idea what I wanted. 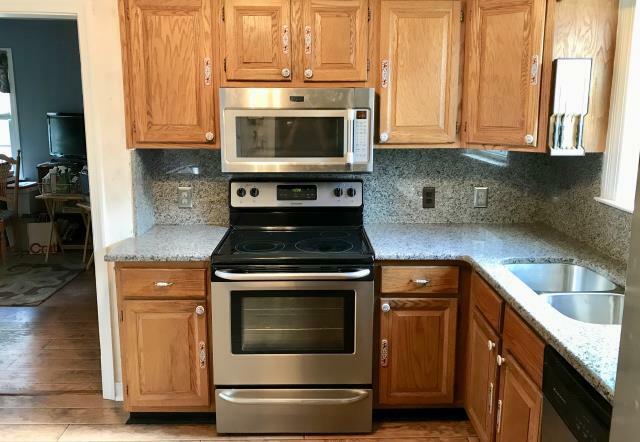 My kitchen was small, little cabinet space, little countertop space, and extremely outdated. I needed some kind of direction. May completely helped direct me. May listened to my concerns and ideas, they came out to my house and took measurements and pictures of the kitchen and brought it back to her. That's when she did her magic! She redesigned it and enhanced it, gave me more cabinet and countertop space than I could ever imagine that little kitchen would have! She is very honest and would tell you if she didn't think something would not look right and explained why. I could not be any happier with what she did and the workers who installed our new cabinet and granite countertops! 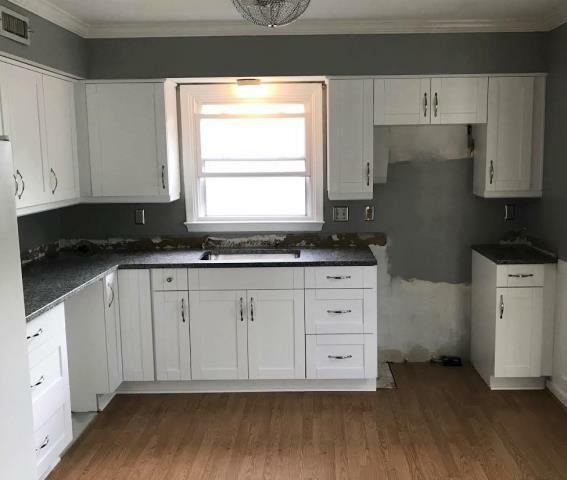 I wish I could show you the before and after pictures of this beautiful kitchen! I highly recommend anybody who is thinking about redoing their cabinets or countertops to go see her! I would have given my experience with May, the install, quality, pricing, and overall experience a 10 star if I could! THANK YOU SO MUCH MAY! Great Design, Accommodating, Great Value! Every stage of the process from early discussions to final design, to installation and problem solving with elements of our renovation was handled positively and professionally by Molly, Mai, and Jay. I am recommending them to everyone I see! Great service till the end! 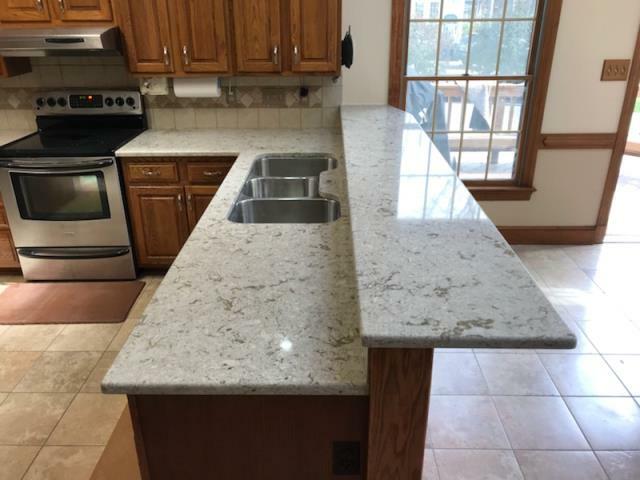 We had many options for choosing our granite and really loved May and the service she gave us. Felt prices were very fair and she was very thorough and made sure we were happy. Wow! Greay service and prices! We love our beautiful kitchen. We love everything. When we have guest over they are blown away by the design, cabinets quality and the granite. We have been refering family and friends to Panada Kitchens and bath. My countertop order from another retailer was unsatisfactory-was going to result in a 4 week wait for tips. Panda helped me select tops, they measured the next day and had them installed in a week! They look wonderful and they made it possible for me to move in on schedule!!! Just finished installing this gorgeous special order Centaurus leathered granite counter. Just finished installing this beautiful white shaker kitchen with new caledonia granite. We love the way our cabinets, counters and backsplash stand out against the homeowners new flooring and wall color! 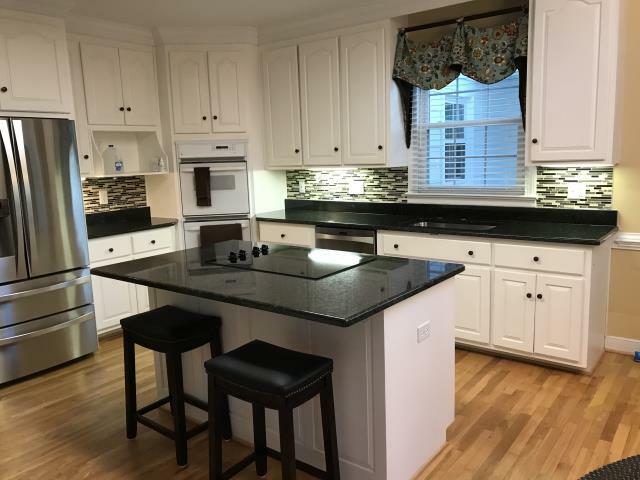 We love our all wood maple double shaker cabinets paired with black pearl granite! 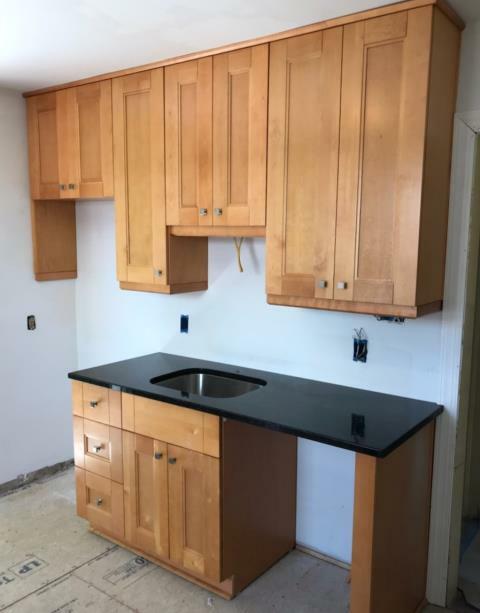 My client purchased the classic white shaker maple kitchen cabinets with the Black Pearl granite for this rental unit. Her tenants are in for a treat. I had the pleasure to install this beautiful quartz kitchen countertop for my sweet client. The name of this quartz is Windermere from Cambria. We hope our client enjoys the two new vanities our installers completed today. 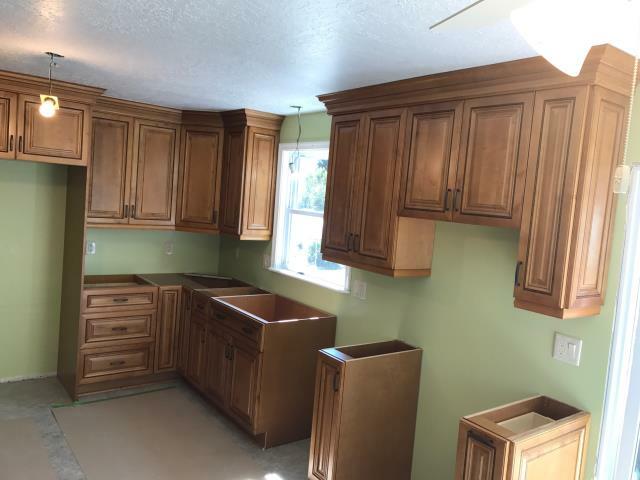 Solid maple wood cabinets with granite tops. 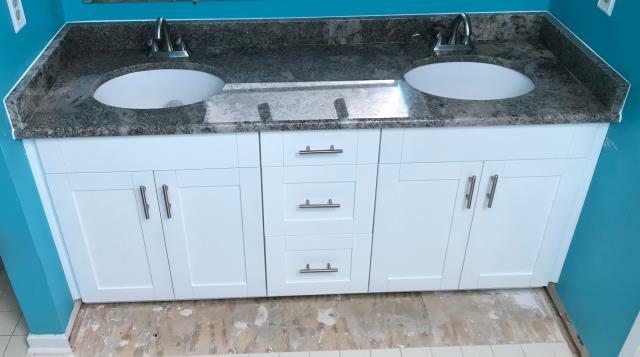 Our installers completed this double bowl vanity with thew hite shaker cabinets and the Ganache granite. These materials are in stock at a great price. The Uba Tuba granite we installed yesterday looks perfect with my client's existing cabinets and tile back splash. The caledonia granite with full back splash looks great with client's existing cabinets. Just finished installing our Rose White granite on our clients existing cabinets. This neutral granite really brightens up this kitchen. Over the years, we have been installing kitchens and baths for my loyal contractor. Today we our company just finished installing this gorgeous basement kitchen for one of his client. The vanilla white maple cabinets are a perfect choice to lighten this basement. Our installers completed this white shaker kitchen with Azul Platino granite all in one day. I can't wait for the tile back splash to be installed. Our company just completed the installation for the Fecteau's kitchen with our in stock Beaded Rope maple cabinets. My client is super pleased with our installers. 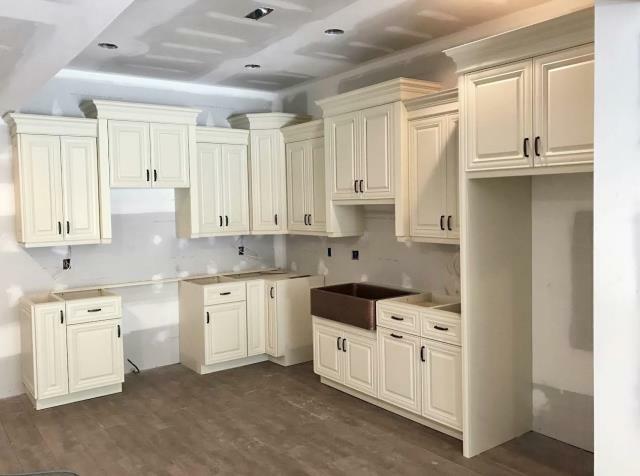 My client who purchased her kitchen from our company four years ago, decided to add solid decorative door panels on all exposed sides of her cabinets. She is so happy with the beautiful finished look. 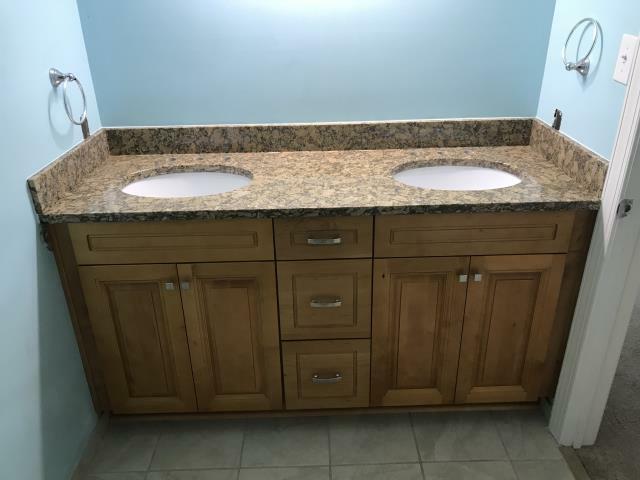 Maple wood vanity cabinets for both bathrooms. Such a pleasure working with my client.